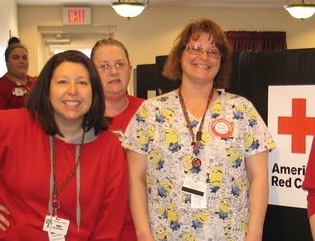 Rolling Fields hosted a community blood drive, in collaboration with the American Red Cross (ARC), to celebrate National Blood Donor Month. The ARC set a hefty drive goal of 29 donors. The Rolling Fields team was able to schedule 61 Donors and collected 34 Donations. Because blood is separated into three components, plasma, platelets and whole blood, we potentially saved 102 lives. This is going to help the critical need to replenish supplies tremendously. All participants received a “Duncan Donors” $5 gift card from Duncan Donuts. William Pond, Culinary Care Partner, was the lucky winner of the $25 Citgo Gift Card provided by the American Red Cross. Nancy Milner, Elder, generously volunteered her time and energy throughout the day by coordinating education requirements and distributing snacks post donation. Each donor received a Thank You sticker and Thank You hug from Nancy. Many Rolling Fields Care Partners expressed their appreciation at the opportunity to Give Back to the Community by conveniently donating at work. Some Care Partners shared personal stories about themselves, friends and family who have benefited from lifesaving blood transfusions and were happy to return the favor.